Okay, even if you’re totally creeped out by kombucha, you have to admit this is pretty damn cool. Brought to you (& me) by the lovely QChan. 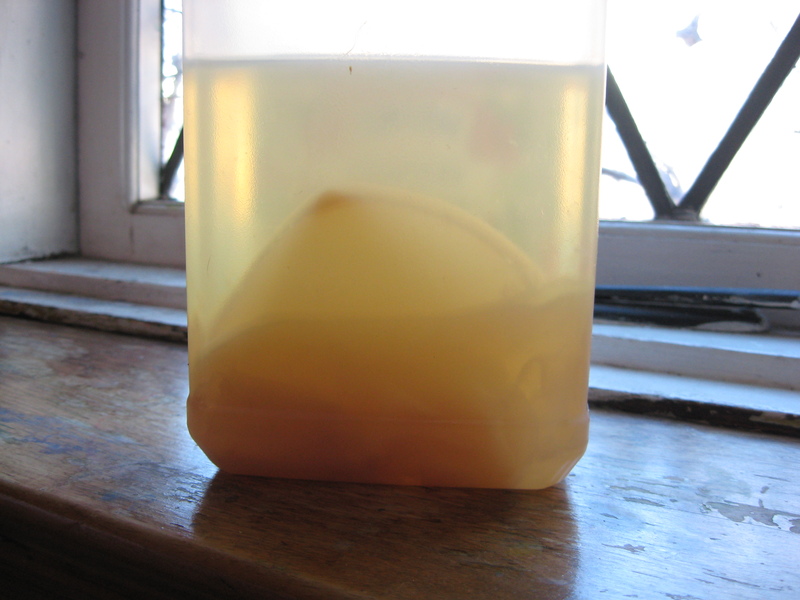 If you’re in Ottawa and you’d like a chunk of my SCOBY, leave me a comment and I’ll get back to you. I could also try mailing a chunk in a zip-lock baggie if anyone is interested in giving that a try! I figured out that when I was brewing in 1 L Mason jars, the mouth wasn’t big enough and was not giving my babies enough air circulation. Either that or it wasn’t the proper ratio of surface area to volume. I started brewing 2 L in a 4 L glass jar with a wide surface, and within 3 or 4 batches, she has recovered completely. So, we’re back in business! But when I put one of the rescued SCOBY babies into my next mason jar of tea & sugar, it sank depressingly to the bottom and settled there, upside down. I was worried. And even more worried when within a few days it had failed to produce a baby. But I didn’t give up. I let it sit there for a few more days, and finally I realized that what appeared to be a transparent barely-there oil slick was actually the beginnings of a baby SCOBY. I left it for a few more days still and it thickened a little, though it was still very transparent and almost unrecognizable as kin with the inch-thick gelatinous disks I had gotten to know. Since then, I’ve been nursing my kombucha mother back to health, slowly but surely. Each batch produces a slightly more substantial baby, though the flavour has been very mild. So, lesson learned: they are resilient, but not infinitely so. I’ll wait until she’s thick and reliable before posting again, at which time I will happily share her with the world. Right now, she’s spending some time in intensive care. P.S. Look what I found in my apple cider vinegar! Is that a SCOBY in my apple cider vinegar? A few weeks ago, I saw somebody who had extra kombucha mushrooms to give away. I had investigated this a year or so ago, but then was too scared to try it in the end. This time, before heading out to the West end to pick up this strange living item, I bought a bottle of kombucha (“The Wonder Drink” brand) to see if I would actually like this fermented tea business anyway. So I went and picked up my mushroom. It’s not a real mushroom, but rather a symbiotic culture of bacteria and yeast (also called a SCOBY) that forms a flat “mushroom” which floats on top of sweetened tea, turning it into this interesting drink. It really is pretty cool. The mushroom is sortof slimy and creepy, and the thing that weirds out my partner the most is that with every batch, it makes a “baby” that floats on top of the old mushroom, which can then be given away to someone else who can start making their own kombucha. I’ve got a couple hanging out in my fridge right now if anyone wants it! What you do to make 3 litres is you steep four tea bags in 1 litre of boiling water, to which you have added 1 cup of white sugar. You dissolve the sugar and let the tea steep for at least 15 minutes. You then remove the tea bags and add 2 litres of cold water. Then you add your mushroom plus maybe a half-cup of kombucha from the previous batch, and make sure the mushroom is floating nicely on top. Then cover with a tea towel and let it sit for a week. After that you bottle it and then enjoy! One website I read said to leave the bottled drink out for a few more days to get it more fizzy, but I didn’t find a great difference. It would be work playing with though. My first batch, I made in a large pyrex bowl. It worked fantastically, but I use that bowl almost daily for baking and whatnot, so I went to a local wine making store (Musca, on Somerset W) and bought a 5 Litre wide-mouth demijohn. This is a wonderful container for making kombucha. The mouth is plenty wide enough to remove tea bags, gently place the mushroom, etc. And the 5 L capacity means there is plenty of air circulation (I have no idea if the kombucha needs this; I’m just guessing since all of the instructions stress covering it with a tea towel, not something air-tight). I just secure a tea towel over the top with a large elastic band, and leave it on the shelf for a week. Is it a miracle drink? There is lots of info out there on kombucha, most of it controversial. Kombucha contains lactic acid, and many of the same pro-biotics as yogurt, so it should aid digestion. There has been no scientific evidence for the claims made by some. The bottom line seems to be that it isn’t dangerous, and it’s healthier than soft drinks. Are you curious? Ottawanians, leave me a comment if you want to try it, or if you would welcome a mushroom into your life. A new baby arrives every week! Come on, share the love!